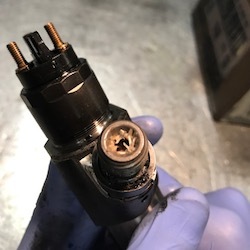 We’ve recently noticed an increase in the number of fuel injector faults where AdBlue has been present in the fuel system. 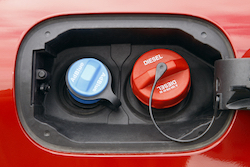 Often the result of mis-fuelling, even immediate tank draining can leave sufficient AdBlue in the system to cause problems such as lack of power, smoke, fault codes and the engine management light coming on. Inspection of faulty injectors shows crystallisation of AdBlue in the injector’s inlet ports (see the image to the right showing crystallisation in a MAN truck injector). As you’ll know, diesel lubricates the fuel system and due to incredibly fine tolerances, AdBlue, water, petrol and even poor quality diesel can lead to premature failures. If you discover AdBlue mis-fuelling, we’d recommend having the diesel pump and injectors checked, tested and flushed before damage occurs. For further advice and recommendations, contact Feather Diesel Services on 01422 387800.